After an intense five game series, EHOME defeats LGD Gaming 3:2 to become the second of the Chinese teams to qualify for The Summit 4 taking place in Los Angeles, California December 9-13th with a base prize pool of $100,000. EHOME joins ViCi Gaming as the Chinese representatives, alongside Digtial Chaos, Team Liquid and Mineski. EHOME is the fifth team to qualify for the event. EHOME have secured their presence at The Summit after having a second shot at attending. ViCi Gaming had swept through EHOME 3:0 in the Grand Finals of the Chinese Qualifiers and they were knocked to the Lower Bracket finals to face LGD for the second spot. 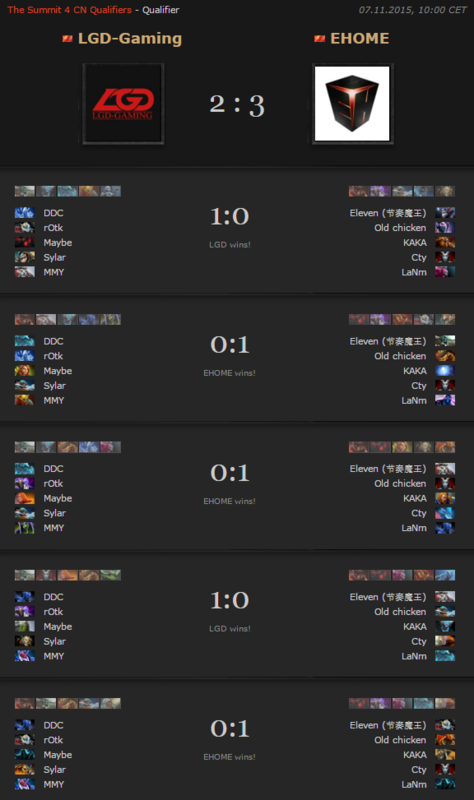 After a back and forth and intense series of matches, it took all five games to decide on a winner, with EHOME finally becoming victorious after a heavily one-sided game with Chen “Cty” Tianyu having an amazing game on his signature hero Queen of Pain. EHOME had defeated both TongFu and then Newbee 2:1 to advance to the grand finals originally.